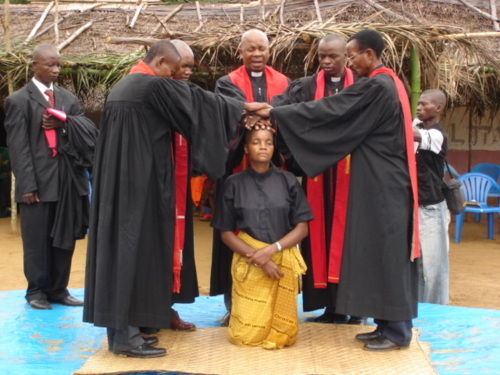 The Congo Disciples blog (read it in French at http://weteto.tumblr.com ) notes that women in the pastorate have brought gender role changes in aspects of the traditional culture as well as in the life of the church. Rev. Regine BOOLA of Bokungu, drumming in the picture above, and Rev. Suzanne INGOY of Boende were ordained last month in their home parishes with the Disciples President Rev. Eliki BONANGA presiding. 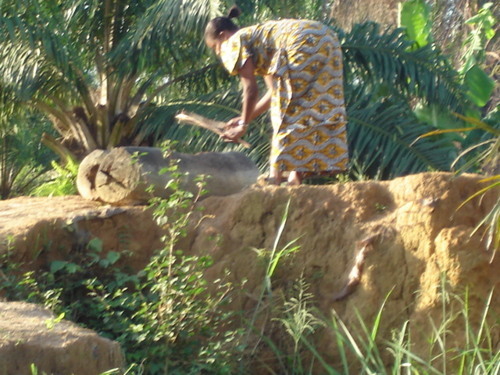 Blog editor Nathan Weteto wrote this week: “according to tradition, only men can sound the “Lokolé, an instrument formerly used for communicating between villages (such as the telephone today)”. 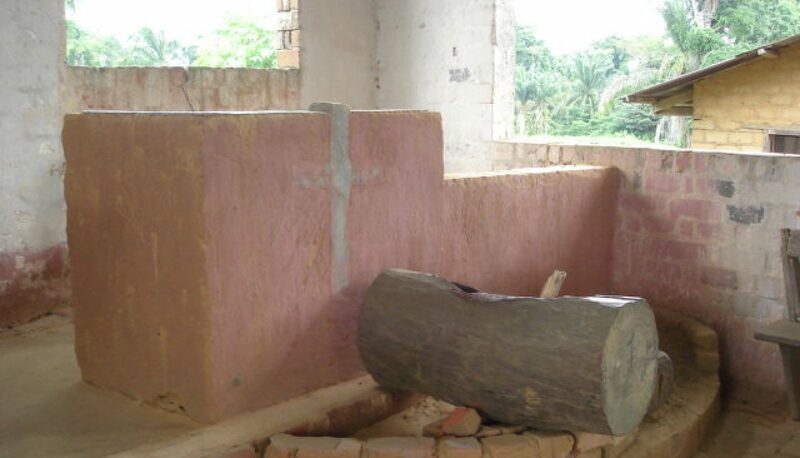 Weteto tells us that churches in Congo have in recent years adopted use of the lokole. And so an increasing number of women like Revde. BOOLA, “play the Lokolé as pastors in their parishes to call the faithful to worship”. following the Palm Sunday worship at Yalusaka, by his estimate some 1000 kms. from Mbandaka. The remote village is in the Mondombe Disciples’ post region, one of several posts on the Tshuapa River. All the Disciple posts along the Tshuapa have been pillaged and terrorized by successive waves of rebel armies using the River to make their way from eastern Congo to Kinshasa. The rebel looting has accentuated the importance and the difficulty of the Disciple posts’ providing the only medical and the only education services, both primary and secondary schools, for the people living along the Tshuapa. Surely Rev. BOOLA and Rev. 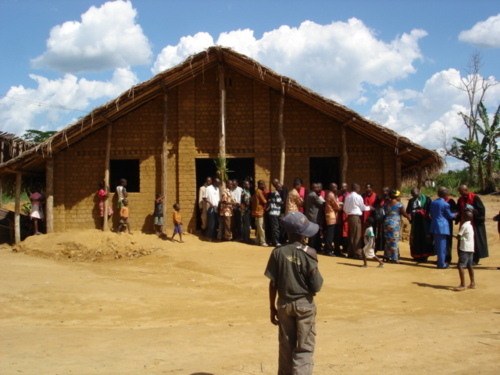 INGOY’s ordination in two posts of the area promise an even stronger response to the church’s call to the local population to build more schools, clinics and hospitals. Footnote to this posting: Dr. Gene Johson, translator of the Weteto blog postings and responsible for Disciple medical services in the Tshuapa region for several years in the 1960’s and 70’s, informed me that Bokungu, nearest Disciple “poste” to Mondombe, has a cell phone tower and therefore may well offer internet service also. Merci pour votre site, ça m’a pêrmis de revoir MBANDAKA et surtout mon père, ça nous as rendues tristes et content ma mère et moi. Je suis la fille ainée du Dr ELONDA. Nous n’avons pas pù visionner la vidéo sur maman ETOMBODJI, contente de voir les pasteurs LIKIO,IKEDJI et les autres Merci beaucoup. I was born in Bokungu in 1957 as a child from Amanda Longoma and a Belgian medical assistant. I haven’t been there since first of all because talking about the Congo or asking questions about my family wa a taboo. I would like to visit and see and feel tha atmosphere before I die.